One of my favorite things about my job is that I work at one of the best songbird migration fall spots in the St. Louis metropolitan area. On Monsanto’s Creve Coeur campus is found a parcel of “unused” wooded acres that are set aside for wildlife and employee recreation. A couple miles of trails and associated edge habitats makes for prime spots for the birders of our campus to work on a very unique form of repetitive stress injury, which we call “warbler neck” 😉 And birders do we have! I have been fortunate enough to learn so much from a handful of world-class birders in the six years or so I have been dabbling in birds. We are now entering the last few wonderful days of the songbird migratory peak within our section of the country. What I wanted to share in this post is an experience we had a couple of weeks back that will likely never happen again. On Thursday, April 18th a terrific storm front moved through the Ozarks in a general southwest to northeasterly course. Sarah and I took this Thursday and Friday off from work and spent it down in the Current River watershed. 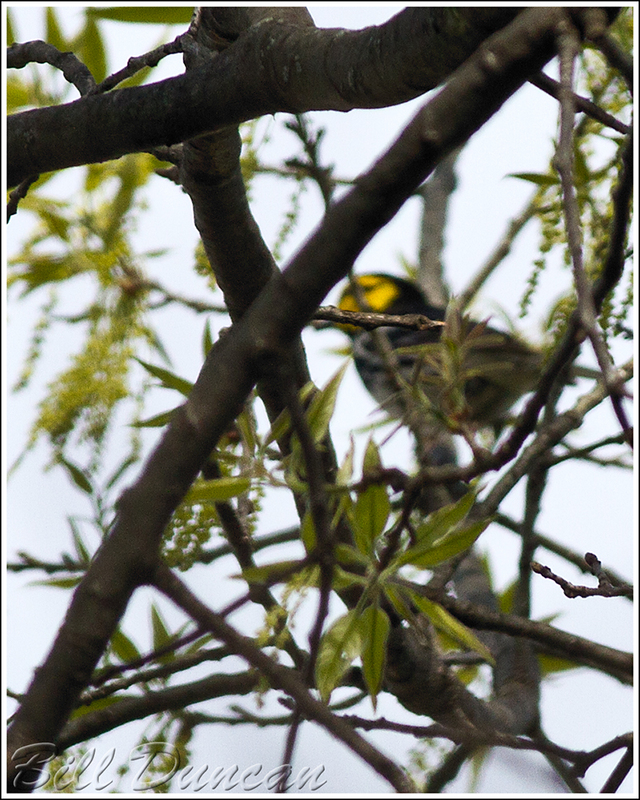 On Friday, my coworker and avian super-freak, Josh Uffman, found what looked to be a very odd-looking and sounding Black-throated Green Warbler. At first, he did not realize what he stumbled upon and went to look this up in the field guides. He then realized his discovery, the arguably most endangered Wood Warbler to be found on this continent, the Golden-cheeked Warbler. Nesting in only specific woodlands containing Ashe Junipers in central Texas, GCWA numbers have declined dramatically by the clearing of these habitats. One bit of disgusting information I read while researching this was that just prior to the placement of this bird under federal endangered species act protection and the IUCN red-list, much of this bird’s critical habitat was cleared by landowners who selfishly wanted to profit from these resources. The most current numbers I could find give estimates of between 5,000 and 10,000 breeding pairs. It is most likely that this bird was moved along by this storm. What is nice for me is that this bird stayed on our campus for a relatively long period of time. When I arrived on Monday it was still here. It was very difficult to get good looks and with nearly two hours of hunting I was awarded with less than 60 seconds of viewing time. The photo below is the best that I was able to achieve. I do think I was the last person to see it on our campus as it was not found the following day. My photo is usable for documentary purposes, but please have a look at Josh’s great pics and videos taken in days prior. Shame, that biodiversity is not a valuable resource. Oh, what I wouldn’t have given not only to see, but to net and fit the little guy with a tracking device to learn the final outcome of his misadventure. I’d really love to think he found his way back to TX, but know that’s probably unlikely. What a story!